Olympic gold and silver medallist and triple World Champion rower Zac Purchase MBE will officially open the new David Lloyd Leisure club in Worcester on December 5. One of Britain’s most successful rowers, Zac will cut the ribbon to launch the state-of-the art club, which is the 81st UK installation for Europe’s premier sports, health and leisure group. Worcester-bred Zac, 26, who won silver at the London Games in the Men’s Lightweight Double Sculls with his rowing partner Mark Hunter and gold at Beijing in 2008, says: “I am absolutely delighted to be opening David Lloyd Worcester, which will provide the Worcester community with a fantastic array of facilities, programmes, coaching and expertise. “This has been the most amazing year of sport for the UK, with the Olympics and Paralympics inspiring a whole nation to get involved with sport. I became interested in rowing when I was 11 years old and I understand the huge importance of engaging youngsters at an early age – not only to nurture the talent of future sporting stars but to help children lead healthy and active lifestyles. Wayne Isaac, general manager at David Lloyd Worcester, says: “We are really honoured to have Zac Purchase open our new club. He is a fantastic role model for anyone – from those who want to achieve their personal health and fitness goals to those who dream of sporting greatness! Representing an £8m investment, David Lloyd Worcester, located next to the Worcester Warriors’ Sixways Stadium, is a stunning 5,600sqm complex featuring three indoor and five outdoor tennis courts. The All Stars Tennis programme, accredited by the Lawn Tennis Association (LTA), will be available to children aged 3-11 and adults will have access to a dedicated team of LTA-qualified coaches. The 25m indoor pool, children’s pool and a 20m outdoor pool will offer a range of activities including aqua aerobics, family swim times and quiet adult swim sessions. David Lloyd Leisure’s All Stars Swimming for children, fully endorsed by the Amateur Swimming Association (ASA), will be taught by a team of qualified coaches and cater for all abilities. Coaching and aqua-based classes will also be available for adults. A key feature will be the 900sqm gymnasium, housing the very latest fitness equipment. Gym instructors will be on hand to provide guidance while a team of qualified personal trainers will offer a more bespoke service for those needing help to achieve specific goals. To complement the gym, a full programme of exercise classes will cater for a broad range of tastes and abilities. There will be three studios, with one dedicated to the popular class of spinning. And members will be able to try the latest dance-fitness craze, Bokwa – the new Zumba! Family sits right at the heart of the David Lloyd Leisure brand and children are always welcome. In addition to the structured, progressive coaching available via All Stars, children will be encouraged to get involved in the activity programme, DL Kids, which will take place in a dedicated zone and is scheduled to synchronise with the adult programme. There will also be an outdoor play area plus a crèche. Other facilities include two physiotherapy rooms and a wet spa area, including spa pool, 2 saunas, a steam room, heated beds and ice machine. And after working up an appetite, the club’s DLicous cafébar lounge, featuring an outdoor terraced area, will offer families a place to relax and enjoy a healthy meal, snack or refreshments. For more information, visit http://www.davidlloyd.co.uk/worcester. For membership information, call 0845 129 6751. The David Lloyd Leisure Group operates 81 clubs in the UK and a further 10 clubs across Europe. It has over 450,000 members and employs 6,000 people. This includes an expert health and fitness team of over 1,800 and the services of more than 350 tennis professionals. Across all clubs, David Lloyd Leisure has over 150 swimming pools (of which half are indoor) and offers over 10,000 exercise classes per week. Every week 20,000 children learn to swim at David Lloyd Leisure and 14,000 learn to play tennis. Its racquets facilities are unparalleled with 700 tennis courts as well as 180 badminton courts and 140 squash courts. Additional facilities include health and beauty spas, club lounges with free internet access, crèches, nurseries and specialist sports shops. Zac Purchase is one of Britain’s most talented and inspirational athletes. He has won a string of titles throughout his career and is one of Britain’s most successful British lightweight rowers with three world championship titles and two Olympic medals to his name. 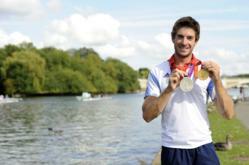 At 22, he won Team GB’s first ever lightweight Olympic gold medal in the Men’s Lightweight Double Sculls with his rowing partner Mark Hunter in Beijing, after an undefeated 2008 season. In the 2009 New Year’s Honours List, Zac was appointed Member of the Order of the British Empire (MBE) in recognition of Services to Sport. Most recently, together with Mark, he won a silver medal at the London 2012 Olympic Games in one of the closest and most emotional finals of the Games.